This post is about simple things that make me happy, happy, happy! When I was in high school, my mom tried to teach me how to sew. I think I started sewing a skirt, and I don’t think I liked the whole sewing thing. I never would have guessed that when I bought a sewing machine of my very own that I would fall in love with sewing. I haven’t sewn any clothes yet (it’s probably better that way) but I am having so much fun with my quilt blocks! Working outside is something I love to do, but don’t take much time to actually do. Every summer, I resolve to spend more time in my yard and less time inside. But then, it gets hot and humid and the mosquitoes come out to play. This spring, I planted my flowers early (for me) since it was so warm. I’m determined to get out and garden more regularly this summer. People have told me that they hate willow trees because they are messy and they are constantly dropping branches all over the yard. I, however, love willow trees. I have a faint memory of the old parsonage in Nebraska having a graceful weeping willow in the yard, and ever since then, weeping willows have been my favorite tree. 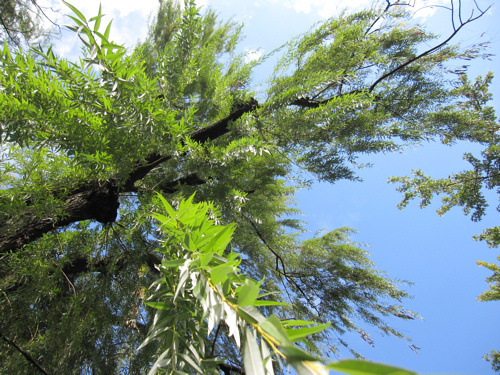 We have a huge old willow in our back yard, and I just love love love the long green leaves and the branches swaying in the breeze. 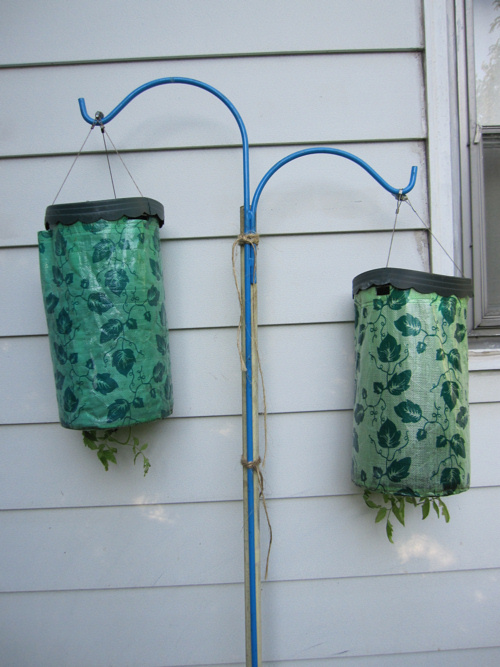 I have two topsy-turvy tomato planters that Ed bought me, but they are so heavy that they bent the shepherd’s crook I hung them from. I needed a much studier hanger…but didn’t have time to go look for one. So I looked around our garage and found a closet pole that Ed had replaced. 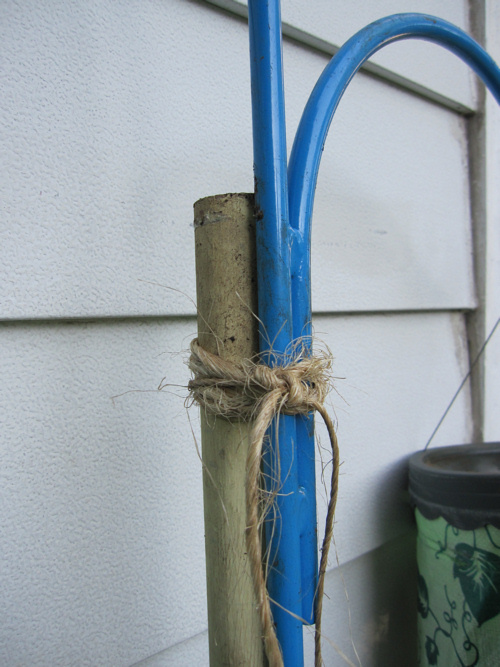 I dug a hole, stuck it in behind the shepherd’s crook, and tied some twine around it. Voila! To my delight (and my neighbor’s dismay–it’s quite unattractive) my fix worked! I am bound and determined to have some home-grown tomatoes this year, even if it means buying them at a farmer’s market. You already love bubble wrap just as much as I do, but just watch this video of Emmy and you’ll love it even more! I could just go on and on with things that I love, but then this post would be way too long and you wouldn’t love me any more. One more thing…I can’t help but love Gretchen, from Second Blooming, who keeps this thing known as the Spin Cycle spinning. Give her button below a click! What an upbeat post, I love it! And that you love your garden and your Weeping Willow tree. The bubble wrap is a good idea too. As for sewing… well, I want to love it, but I'm not good enuogh yet! My recent post To &quot;C&quot; or not to &quot;C&quot;? That is the question. Give a kid bubble wrap and they are occupied for hours–depending on the size of the bubble wrap. I love figuring things out, too. _And that bubble wrap! She is just too cute! I have got to get a couple large sheets of that stuff! Oh, the bubble wrap sure brings back memories…always disappointed when packages come with styrofoam peanuts. Oooh, I love weeping willows too! I always thought they were the most romantic of all the trees! 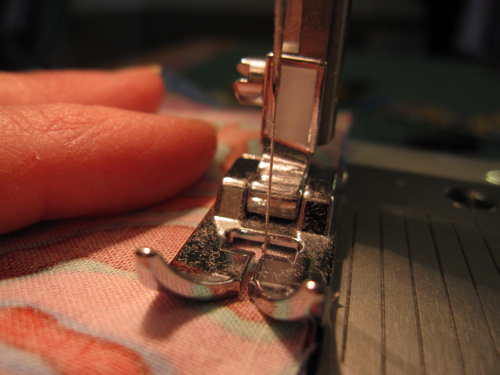 I had a love affair with my sewing machine that lasted about 10 years. For a while, I made all my clothes, and made clothes for my boys when they were little. Then when I went back to work full time, the love faded. I never did make a quilt; I feel guilty about that. Now, 30 years later, my new loves are my laptop and my Kindle! I just stopped by from SITS to say hello; hope you find time to do the same. Wow I love watching the video the kids was really cute when she dancing.. Thank you so much for the love!! I love your list! 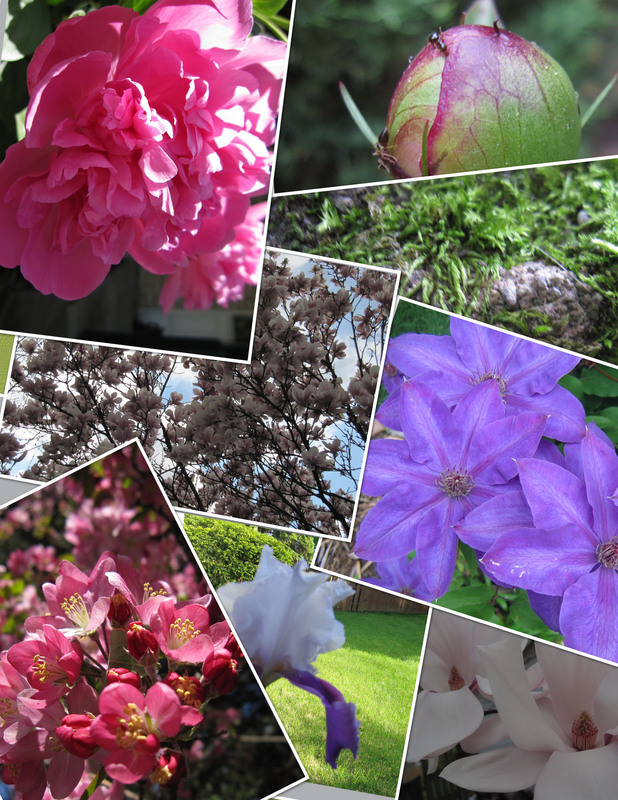 I need to get more invested in my yard – I know if I gave it a little more love, it would love me more too! And I don't know if Emmy could be any cuter! Jude just came over and watched and deemed her "very cute" and wanted to know how many "likes" she had on YouTube. We "liked" her, by the way!